Cheim & Read is pleased to announce the relocation of the gallery to 547 West 25th Street (between 10th and 11th Avenues), New York City. 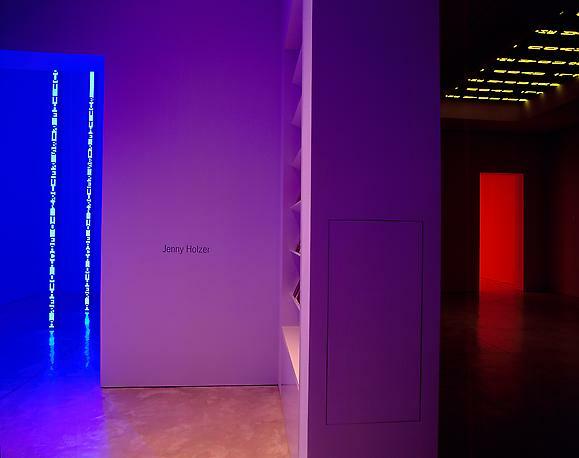 The inaugural exhibition, which opens on October 16, presents new work by artist Jenny Holzer in her first New York gallery show since 1994. Cheim & Read was established on West 23rd Street in 1997 by John Cheim and Howard Read. The new 6,000 square foot gallery, previously a freestanding garage, was designed by the acclaimed firm Gluckman Mayner Architects. The new ground floor space features two large exhibition galleries. A smaller, third exhibition space will accommodate smaller works. All three exhibition rooms include skylights and have 16 foot ceilings. The new space will also contain two small private viewing rooms as well as offices and on-site storage. installation by Holzer, featuring her new written work, OH, an intimate text about a girl child. OH will run on multiple electronic signs, playing with the skylight architecture of the new gallery.